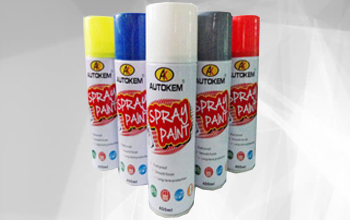 AK MULTI-PURPOSE SPRAY PAINT is easy to use and suitable for virtually any interior or exterior surface. It is quick drying and gives an ultra smooth finish. It is tough, hard wearing and resistant to scratches. It comes in gloss, matt and satin finishes with the addition of primers and top coat. Offers a wide range of colors including metallic colors and fluorescent colors.